Can you tell me how to get, how to get to Library Way? SLLG member, Lissie, didn’t need to pack any holiday blockbusters when she travelled to New York this summer and stayed at the Library Hotel. If you’re planning to go on holiday and can’t quite bear to leave your work at home, then The Library Hotel is probably for you. 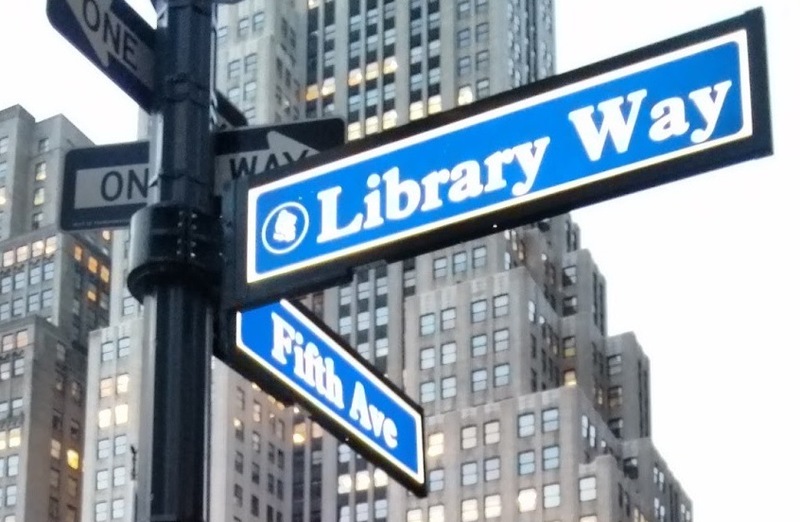 Located in Midtown Manhattan, the hotel is one block away from the New York Public Library, right in the middle of a two-block stretch of East 41st Street that was renamed ‘Library Way’ in the late 1990s. 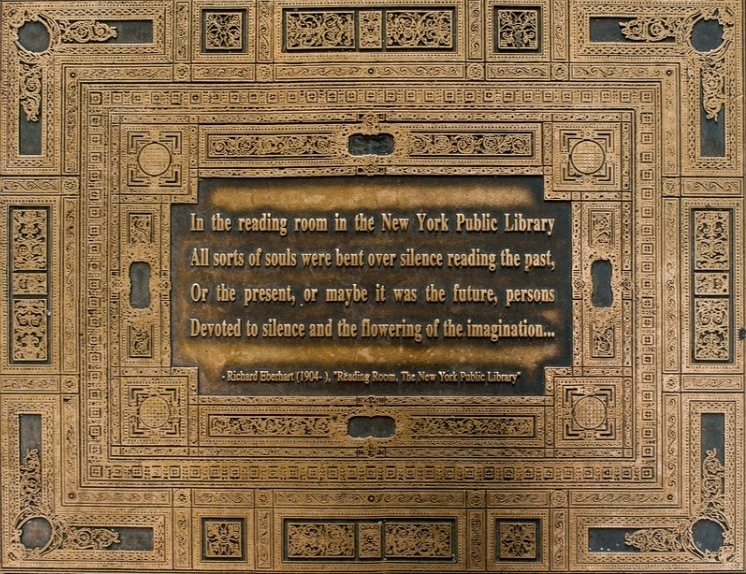 The sidewalks are decorated with bronze plaques containing literary-themed quotes, enabling me to experience the real rage that New Yorkers feel towards tourists who stand still and stare at the ground! 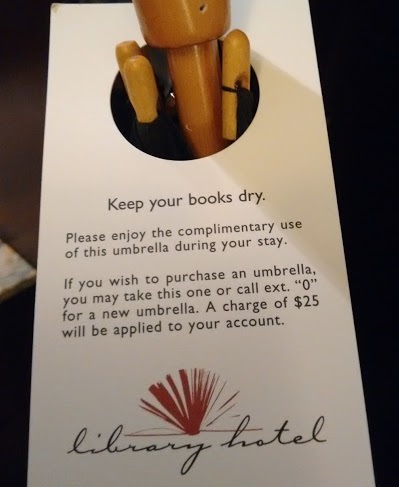 The hotel itself has completely embraced the library theme. 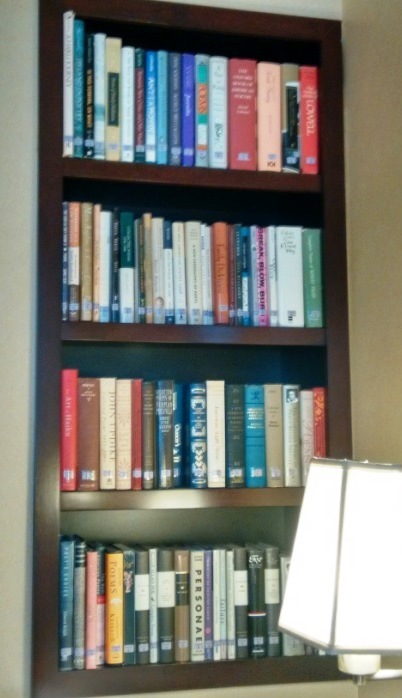 It’s not just a normal hotel with lots of extra bookshelves! All of the bedrooms have their own subject and are organised following the Dewey Decimal system. There are ten floors, each floor corresponding to one of the ten main categories of the Dewey Decimal System, and the type of room determines your decimal. 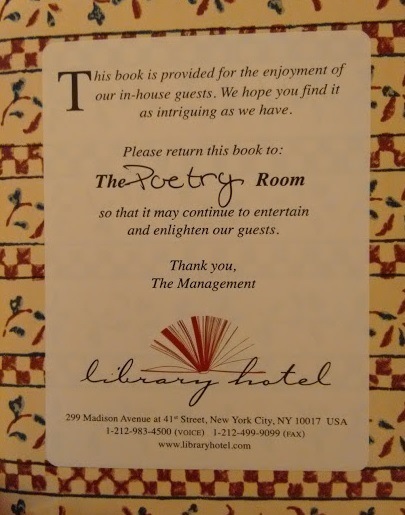 We ended up on the eighth floor – Literature – and were staying in a “Petite” room, meaning that our theme was Poetry! Why not stay in the law library room? Why not Law, I hear you ask? When we first looked at the hotel we wanted to stay in the Law room, but it turned out to be slightly out of our price range. Those third-floor junior suites don’t come cheap! As with most things in life, you get what you pay for. The Petite Room really lived up to its name. But despite its size, there were books aplenty! 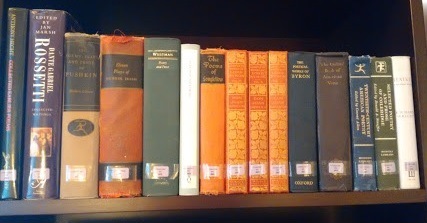 Most of the Library Hotel’s books have been donated. 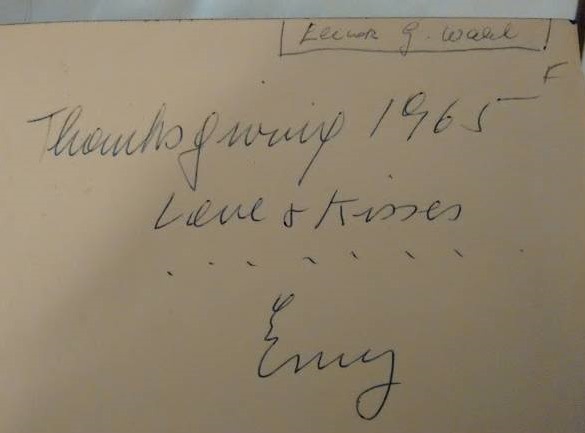 I had fun finding messages and dedications written inside some of them, when I wasn’t busy photographing every library-themed object in the room, that is! Unsurprisingly, I loved staying in The Library Hotel. As New York hotels go, it’s pretty on the small side, and doesn’t have a lot of the amenities that other Midtown hotels can offer. 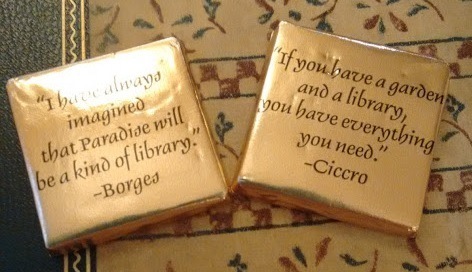 However, you immediately forgive them when you see the staff’s incredible attention to detail and obvious love of the library concept: Chocolates! 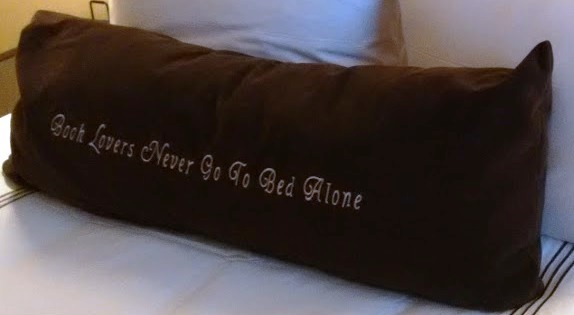 Pillows! Umbrellas that definitely weren’t worth $25.00! I would definitely stay again. The only real downside is that after travelling all the way to New York, I wanted nothing more than to curl up in bed with a good book! So jealous! Heard about that place a couple of years ago and would love to go one day! Glad it lived up to expectations!